The most potent forces, those that compel extraordinary individuals to create the things that move and inspire us, are passionate and sophisticated. For its latest campaign, Oliver Peoples illuminates and unravels the creative catalysts behind those forces. Featuring eight remarkable talents, each one a vanguard in their arena, “In Conversation” presents a meditation on the creative process captured through the lens of photographer, Matthew Brookes. In four vignettes, these talents engage in discussions that grant insights into their crafts, delving into their varied inspirations and aspirations to reveal eight ingenious ways of seeing. Ultimately, the series not only paints an aesthetically and intellectually captivating portrait of each persona, but also offers a greater understanding of the artistic practice. Set against the backdrop of the breathtaking John Lautner’s Harpel House, a historic Hollywood home that displays architectural mastery and astounding elegance, this series brings together figures that both reflect and inspire the brand. It features charismatic magazine mogul Dorian Grinspan paired with art world prodigy Lawrence Van Hagen, acclaimed Parisian design duo Festen Architecture, ethereal artist Tasya van Ree, curatorial mastermind Jordan Watson, as well as the soulful songstress Lianne La Havas and rising popstar CYN. While each of these talents is undeniably of the moment, they simultaneously possess that impalpable timeless quality. 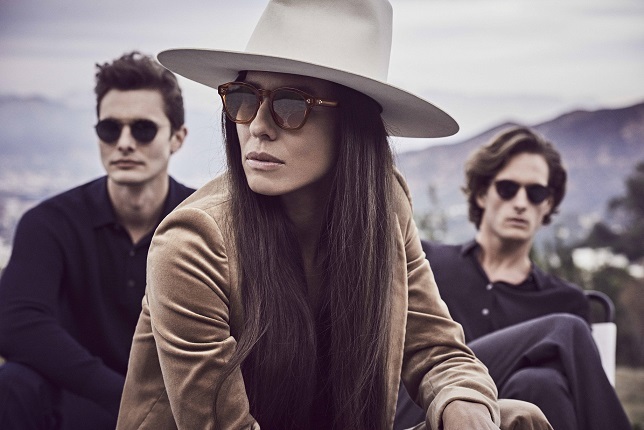 For over 30 years, Oliver Peoples has been singularly dedicated to setting the standard for luxury eyewear through an unrivaled commitment to craftsmanship and design – a dedication that can be felt in each of the brand’s iconic frames. Like Oliver Peoples, these talents set new standards that are perpetually driven to create meaningful work that inspires and endures. “Over the past two years as Creative Director of Oliver Peoples, I’ve had the chance to meet many talented and creative people from different industries all around the world. When conceptualizing our campaign, it came naturally to think of presenting authentic and interesting individuals as the faces for the brand. From architecture to design, from music to art and photography, “In Conversation” represents both an inspiration for my work and the embodiment of the Oliver Peoples values and aesthetic.” – Giampiero Tagliaferri, Creative Director, Oliver Peoples.